Rutin is a natural substance that can help prevent and treat numerous health conditions. It’s a plant chemical (flavonol) present in the leaves and skins of citrus fruits, apples, buckwheat flowers, plums, apricots, grapes and cherries (x). You can also drink it in tea leaves and other plant-based beverages (x). People have used rutin, as a tea or food, in traditional medicine for centuries (x). Rutin has been the subject of many animal studies and some human studies. Research has discovered its many useful properties — it’s an antioxidant, anti-inflammatory, antidiabetic, anticlotting agent and anticancer agent, among many other things (x). Rutin may help people treat joint and bone problems (x). Firstly, as an anti-inflammatory and antioxidant, it may be an effective aid to arthritis and osteoarthritis treatments. Moreover, because it helps boost bone-forming activity in the body, it may improve the degenerative conditions of osteoporosis and osteopenia. Lymphedema is a buildup of protein-rich fluid under the skin. It causes swelling in the legs or arms. Rutin, however, may treat lymphedema by helping the body break these proteins down (x). Rutin helps to rejuvenate the skin by supporting the production of collagen and vitamin C. One study found that it helped improve skin elasticity, decreasing wrinkles (x). It can also help to protect the skin against harmful UVA- and UVB-ray damage. In fact, one study found that a rutin-based emulsifier had an SPF value of 30 (x), and a second study found that it could treat atopic dermatitis and allergic contact dermatitis (x). Rutin may slow down baldness as well — a very unwanted sign of aging in both men and women. Research has noted that it prevents cellular death in hair follicles (x). In an animal study, rutin improved many metabolic markers of aging, such as blood glucose, insulin levels, blood pressure, inflammation, antioxidants, blood fat levels and cellular health (x). Healthy blood circulation helps to ensure good overall health. Blood brings oxygen to the brain, liver, kidneys (among other organs) and every cell. Good circulation also removes metabolic waste from the body and keeps skin healthy. But aging and certain health conditions can affect these processes. Supplements to improve circulation, particularly rutin, can help make a significant difference to your quality of life. Chronic venous insufficiency happens when veins in the legs begin to weaken, causing painful varicose veins. Taking rutin helps to increase blood flow, widen and strengthen veins, improve vein flexibility and reduce inflammation and swelling (x, x). It is also very effective in lowering high blood pressure (x). Rutin can benefit people suffering from varicose veins, spider veins, venous ulcers, hemorrhoids or small vessel disease. It also alleviates bruising and internal bleeding. Its anticlotting properties help to reduce the risk of heart attack, stroke, deep-vein thrombosis and pulmonary embolism (x, x). Research has found that rutin has a protective effect against stroke by helping the brain to recover the loss of sensorimotor skills. It also protects the heart where narrowed heart arteries are present, and when isoproterenol is used to treat abnormally slow heart and heart block (x). As a potent antioxidant, rutin is able to lower harmful low-density lipoprotein (LDL) cholesterol levels in the blood (x). Diabetes is linked to many health complications. However, various studies have shown that rutin may be effective in preventing or treating problems associated with diabetes (x). Rutin helps balance blood sugar levels by reducing plasma glucose, increasing levels of insulin and refreshing pancreatic islets (x). It may also prevent dysfunction of the endothelium cells lining veins and lymphatic vessels when glucose levels are high. This can help prevent diabetic vascular complications (x). In an animal study on type 1 diabetes, rutin had a protective effect on sperm and testicular tissue (x). Researchers have also noted that it alleviates diabetes-related dysfunction in the heart and protects heart tissue. It may even stimulate cell survival in diabetic retinopathy (x). In an animal study focusing on diabetes, rutin improved memory and learning ability. This means it may be an effective aid to treatments of diabetic neurological disorders (x). Rutin may make a significant difference in the fight against cancer. In various studies, researchers found that it actually inhibited many cancers. These include leukemia, neuroblastoma, colorectal cancer, pulmonary metastasis, melanotic melanoma, hepatic carcinoma and pancreatic cancer (x). In animal studies on lung and colorectal cancers, rutin decreased the number of cancer cells and free radical superoxides. To add, it may suppress malignant changes in cells and stimulate immune response (x). Rutin not only slows down tumor growth but also reduces the side effects of cancer treatment, such as painful mucositis in the digestive tract. It can protect the heart, kidneys and liver during chemotherapy and radiation, and reduce chemotherapy side effects (x). It can also enhance treatment outcomes of radio-iodine therapy, which doctors use to treat overactive thyroid and thyroid cancer (x). Another study found that rutin reduced radiation-induced oxidative stress (the body’s inability to fight damage from free radicals) (x). 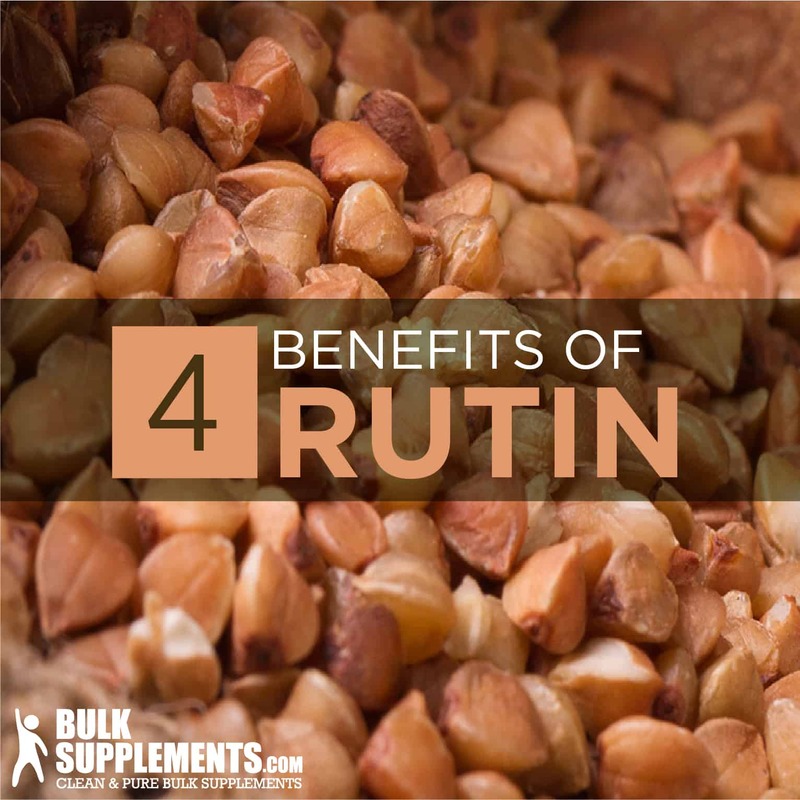 Rutin produces various beneficial effects on the brain and central nervous system as well. It produces a neuroprotective effect on the brain during brain ischemia (decreased blood supply to the brain). Feeling anxious? Rutin can act as a sedative. It may also act as an anticonvulsant. But don’t let it stop there. It can also function as a pain killer and improve depression — let it be your brain’s best friend (x). Rutin has shown neuroprotective properties in many studies (x). It shows potential for improving problematic behaviors and mental functions in people living with Alzheimer’s, Parkinson’s and Huntington’s diseases. The effects may be due to its antioxidant, anti-inflammatory and cell-protective properties (x). In animal studies, it improved the survival of dopaminergic neurons, which are reduced in patients with Parkinson’s disease (x). An animal study found that rutin improved liver function in animal test subjects (x). Some studies have found that rutin helped protect the stomach and digestive system from ulcers and promoted colonic healing after colitis (x) (x). In animal studies, rutin showed significant potential for treating inflammatory bowel disease (x). Various animal studies have found that rutin helps to prevent and treat macular degeneration, glaucoma and cataracts. Another study has found that rutin can protect the eye lens and retina (x, x). Some studies have shown that rutin can act as an antifungal, antibacterial, antimalarial and antiviral agent. Also, research has noted that rutin may even impact some HIV strains to an extent (x). Rutin protects white blood cells in the spleen, which are vital for fighting infection and producing antibodies (x). Research has also noted that it produces an immune-boosting effect at the cellular level (x). Rutin provides safe allergy relief by reducing antihistamine production and inflammation. It improves asthma symptoms by relaxing smooth muscles in the airways and reducing leukocytes in lung tissue (x). Applied to the skin, rutin relieves atopic dermatitis and allergic contact dermatitis (x). The US Food and Drug Administration has established that rutin supplements are generally safe to use (x). In a small number of people, rutin may produce side effects such as light-headedness, nervousness, flushing, minor stomach upset, blurred vision, headache, rash, muscle stiffness and fluid accumulation in the knees (x). A small number of people may be allergic to rutin. Symptoms of an allergic reaction may include hives, breathing difficulties, chest pain or swelling of the face, lips, tongue or throat. Report serious symptoms to a doctor as soon as possible. People taking blood thinners or any other medication should speak to their doctors before taking rutin. Pregnant or nursing women shouldn’t take it, and it shouldn’t be used over the long term without a doctor’s approval. As a dietary supplement, 650 milligrams (just under a quarter teaspoon) of rutin may be taken once a day, or as directed by a physician. To improve rutin’s effectiveness, take it together with vitamin C.
Rutin is a proven nutraceutical that can relieve or in some cases prevent many health conditions. A therapeutic dose of rutin can help you improve a specific health condition, especially when your fruit and vegetable consumption is low. Research has widely praised rutin for its powerful healing properties and wide range of health benefits. Taking rutin supplements should not be a substitute for wholesome eating. However, supplementing may help treat a range of health conditions. On the whole, rutin offers significant whole-body benefits.